Road access to the interior Yukon was unreliable if not non-existent for much of the Territory’s history. Prior to the mid-twentieth century, rivers were the highways of the Yukon, serving as important transportation routes first for First Nations peoples, and later for gold-seekers and prospectors heading towards the Klondike. During the gold rush, the Yukon River was crowded with shanty rafts carrying prospectors who hoped to find gold along the river banks of Dawson. 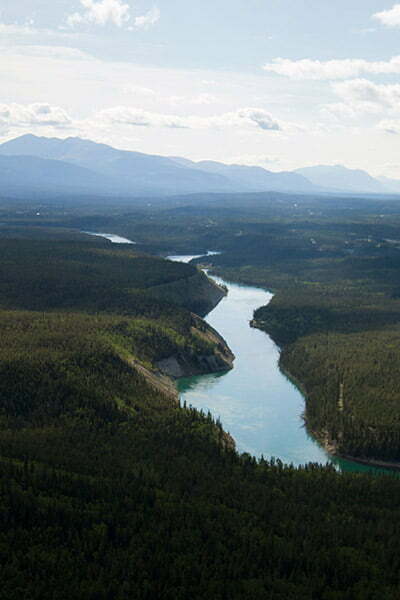 Though the primary route for gold-seekers was along the Yukon river, overland travelers also reached the Klondike by traveling north on the Peace River from Edmonton and connecting to the Pelly River to reach Dawson. Later, steam-wheelers brought mining equipment, food, and miners back and forth between Whitehorse and Dawson along the Yukon River, playing a key role in the development of both communities. The heyday of river transport in the Yukon declined once the Alaska Highway and the North Klondike Highway were built in the 1940s and 50s, but the history of the Yukon has been forever shaped by the rivers that brought traders, travelers, and prospectors to the Yukon. Today, the highways make for comfortable, convenient transportation, but the rich history of the Yukon River, the awe-inspiring scenery of the Peel, and the famous whitewater of the Tatshenshini-Alsek rivers draw many river travelers to the Yukon to each year. Talk to a local outfitter to see how you can make a river adventure part of your travel plans.